Studio Style Coverage. The same type of report that we write for our studio & production company clients. Coverage contains a logline and synopsis of the script followed by the reader's overall impressions including its strengths and weaknesses. Following that is an evaluation grid which rates different aspects of the script. If you don't need a synopsis, then our StoryNotes is a better option. When should you order Coverage? - Coverage is useful for a first look. It’s an economical way to find out how your screenplay rates. - Coverage lets you discover the strengths and weaknesses of your screenplay. - Coverage gives you a concise logline and synopsis for your marketing needs. - View this Sample Coverage to see how your report will look. Analysis and Development Notes. StoryNotes are not Coverage. Coverage was created so that executives could have someone else read the full script and give them a sense of the story and its viability. But if you don't need help in creating a concise logline and synopsis of your story and just want analysis and recommendations to improve your script, then StoryNotes is the most economical option for you. You get 2-4 pages of page specific notes, analysis of the screenplay's strengths and weaknesses, and recommendations for improving your story. When should you order StoryNotes? 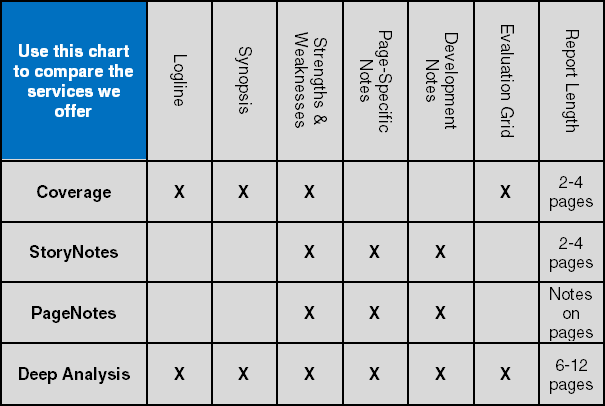 - StoryNotes gives you 2-4 pages of analysis and specific recommendations for improvement. - StoryNotes lets you discover the strengths and weaknesses of your screenplay. - StoryNotes is similar to but slightly lighter than our Deep Analysis service. - View this Sample StoryNotes to see how your report will look. Analysis and Development Notes written directly on your script pages and returned to you! Similar to the StoryNotes report, but notations are made right on your script pages. Some writers find it more helpful to read page specific notes, corrections, and recommendations in this format, rather than on a report with citations printed separately. Available both for printed scripts and scripts in Adobe PDF format. When should you order PageNotes? - PageNotes gives you extensive analysis and specific recommendations for improvement. - PageNotes lets you discover the strengths and weaknesses of your screenplay. - PageNotes lets you discover and take in the notes as you re-read your screenplay. Our most comprehensive Service. With Deep Analysis, you get all our best analysis services in one package. Deep Analysis includes everything you get with our Coverage service plus a vastly expanded version of our StoryNotes service. You get 6-12 pages that include a logline and synopsis, page specific notes, analysis of the screenplay's strengths and weaknesses, recommendations for improving your story, and an evaluation grid. When should you order Deep Analysis? - Deep Analysis gives you 6-12 pages of analysis and specific recommendations for improvement. - Deep Analysis lets you discover the strengths and weaknesses of your screenplay. - Deep Analysis is less expensive than ordering these individual services separately. - View this Sample Deep Analysis to see how your report will look.  Rush Service - only $25 additional which guarantees delivery in one week or less.  SUPER Rush Service - only $50 more which guarantees delivery in three business days. Coverage, StoryNotes, PageNotes, Deep Analysis, Logline-Synopsis and Query Letter services.